In response, Love sounded like a Obama campaign ad: "I think the thing that isn't caught by all the American people, which I wish everyone could see, is that not only is he committed to, you know, being a father and being a leader every minute of the day, he never – he doesn't stop thinking about it." BRIAN WILLIAMS: If you've been paying any attention at all to the President these three years, then you've seen the guy right behind him. Often mistaken for a Secret Service agent, he is Reggie Love, the body man. And that means Sherpa, confidant, portable desk, and a better than average basketball player. BARACK OBAMA: When he's on my team, I say to Reggie, "Don't shoot." WILLIAMS: Reggie Love played at Duke under Coach K, which may have instilled the discipline he's needed all these years at the President's side. He'll need it again now as he seeks an MBA at the Wharton School, University of Pennsylvania. Every president in the modern era has had a body man. The official title, Special Assistant to the President. Unofficially they do everything. When the President wasn't on the move somewhere, Reggie sat right outside the Oval Office and he saw it all and heard it all. OBAMA: There are times where I'm not so calm. Reggie Love knows. My wife knows. WILLIAMS: He famously carried the President's Sharpies and Altoids and chap stick and cell phone and children on occasion. And along the way, the two men became very close. The President has referred to Reggie as the little brother he never had. Reggie Love here with us in the studio. What are you possibly going to do to fill your time after what you're used to now, and the pace of life? REGGIE LOVE: I don't think anything can possibly fill the void that will be left by me leaving the White House. I do think that there's still a lot of things that I haven't been able to do just because I've been so committed to the job and to the campaign. I missed a lot of Thanksgivings, a lot of Christmases. So hopefully I'll get a chance to spend more time with my family. More time with the girlfriend. And hopefully, you know, get to enjoy life a bit. WILLIAMS: You're a very discreet person anyway. And if you're going to do this job, I've known several of the body men over the years. They sign on, I mean, it's expected you will be discreet. But broadly, what is it about the President and his family that you wish all Americans could see? LOVE: I think the thing that isn't caught by all the American people, which I wish everyone could see, is that not only is he committed to, you know, being a father and being a leader every minute of the day, he never – he doesn't stop thinking about it. WILLIAMS: Someone once told me the First Family is like a retro almost 1950s American family, that there's a – kind of a wholesomeness about them. They play board games, they play on the floor of the living room with the dog, they're not – the girls aren't allowed a lot of TV and social media. LOVE: No TV during the week. I don't know how they do it. But, you know, I think – I wasn't born during the 1950s. 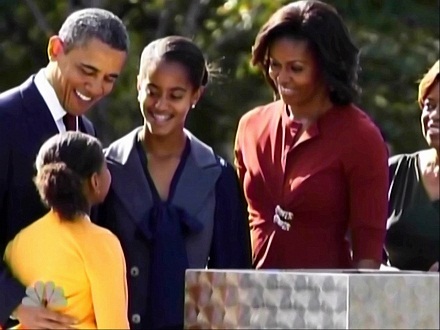 My family and my parents were very similar to what President Obama and what Mrs. Obama are for the girls. They're there for the kids but they also work extremely hard. And they somehow manage to sort of put it all together. WILLIAMS: Let's talk about rope lines. They're a harrowing kind of thing. There are people clamoring for the president, there's media, there's Secret Service, there's guys with guns to your right and left. And yet, there's also, if you look closely, this ballet. People give the president things from babies to books to mementos. And the stuff he can keep he quietly hands back to you. What happens to all that stuff? LOVE: Well, it is a lot of stuff, and you're right, sometimes they're babies and sometimes they're kids that, you know, they're handing off that aren't babies that shouldn't be handed off. And you know, sometimes they're notes or they're gifts. And typically, you know, I make a log, a note of everything. And if it's a letter from a constituent, we make sure that, you know, he gets a chance to look at it or read it. And then make sure that they get a response written. Or if it's a gift, you know, it gets filed and registered and screened and processed. And then it ends up in its appropriate place. And it is like a dance a little bit, you know. You see all the agents, and you know, everyone sort of stepping with the appropriate foot, not trying to step on each other. WILLIAMS: Did everyone just assume – am I correct in assuming everybody thought you were a Secret Service agent, who didn't know you? LOVE: For the first – I mean, I think even now people still think that I'm Secret Service. I like to believe it's because of my stature, right? WILLIAMS: Yes, and your demeanor, the way you carry yourself. LOVE: But it never bothered me. I think it's good for people to think that, you know, that the President or when he was – or while he was campaigning, that he had someone sort of watching out for him. WILLIAMS: Finally, finish this sentence for me. The amazing thing about seeing presidents up close is? LOVE: I would say the most amazing thing is, to see their candor, to see that they're real people. They have emotions, they have feelings. They go through similar things that you go through, that your parents went through. But I think it's also amazing that they're able to handle a lot of that stuff under the pressures of, you know, intense media scrutiny. And it's a fine balance. WILLIAMS: Well, you've gotten that balance right, according to all reports. Reggie Love, it's great to see you again. LOVE: Thank you, I appreciate you having me here today. WILLIAMS: Good luck as a young man entering the second half of your life. LOVE: Oh, man, Hopefully I get more than half, I'm only 29, so. WILLIAMS: Yeah, you'll be all right, something tells me you'll be all right.